Castiglione worked in Genoa as a painter and printmaker. 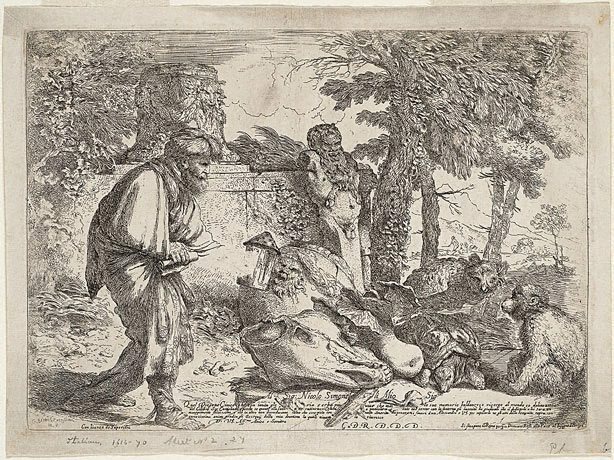 His etchings are particularly indebted to Rembrandt and they in turn influenced such artists as Tiepolo and Fragonard. This etching, in which the left arm of Diogenes has been left unfinished, represents some of the most traditional elements of Castiglione’s iconography: the vase, the half-bust sculpture, the animals, the ox skull. The story of Diogenes the Cynic who searched with a lantern at midday for an honest man, is told by Diogenes Laërtius in his ‘Lives of philosophers’.